HER BEST STYLE: She has variations on a medium-long, thick theme. She can part her hair down the middle, or to the side. She can tease it, or let it hang naturally. She can wear it straight and strong, or add perm-like curls. 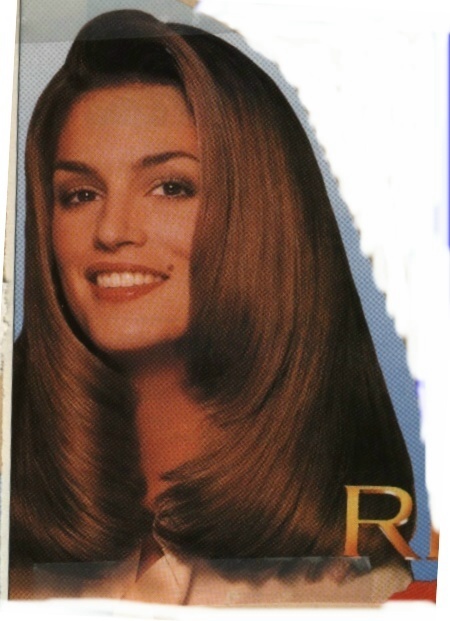 HISTORY: Even though she has a wide variety of looks, almost all of them look good - as a supermodel's Super-Hair should. The changes not only provide variety for photo shoots, they make her hair tough to analyze for a regular weak spot. As a former high school valedictorian, she's as smart as she is gorgeous. She seems to adjust her style to the situation, and especially to the amount of pressure her hair is likely to face. Wind-blown outdoor events usually bring out the curls; she uses them better than anyone to give her hair extra muscle and strength. WHY SHE'S RANKED HERE: Many would be quick to consider her Top Ten material - and we might have done that, except for one photo shoot when she let this magnificent mane cover most of her face. ©2000-03 www.super-hair.net All Rights Reserved.